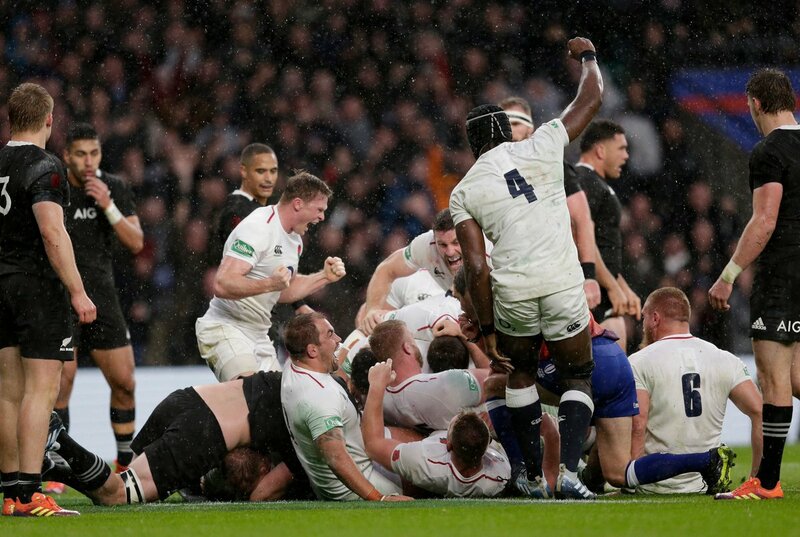 New Zealand triumphed 16-15 over a pugnacious England side in a rainy clash in South-West London. England raced into a 15-0 lead through tries from Chris Ashton and Dylan Hartley, but the All Blacks hit back with Damian McKenzie’s try before half-time, and 11 points from the boot of Beauden Barrett ensured that they can travel to Dublin next week off the back of a victory. The last time New Zealand played against England at Twickenham, Jonny May ended speculation over his international quality in screaming through after four minutes for his first Test try. Four years later, it was the returning Chris Ashton who scored in the early stages. While May was proving his mettle on the global stage, there was little pre-match doubt that Chris Ashton has what it takes to compete for England on his first start since returning from Toulon, where he broke the Top 14 try-scoring record in his first season. Brodie Retallick had been billed as the All Blacks’ key man heading into the Twickenham clash, but it was his knock-on from the opening kick-off that led to Ashton’s opportunity in the corner, which he grasped with both hands. England were rampant, but in Beauden Barrett, New Zealand have one of the finest game managers in the world. The Kiwi fly-half was marching his team around, peppering the back-field with kick after kick, looking for valuable territory. But it was Owen Farrell who held the upper hand, extending England’s advantage to eight through a drop-goal. Farrell had the help of a surprisingly dominant pack – Kyle Sinckler was a threat in the loose, while Sam Underhill was hitting the Kiwi backs with thunderous force. And it was the pack who guided England in for their second, driving over the whitewash from a line-out inside the 22. Suddenly, an underpowered, depleted England side found themselves 15 points ahead against the World Champions. It looked as if England would hold their lead until the interval, but New Zealand are ruthless, and they hit back through Damian McKenzie after a spell of ferocious Kiwi pressure. From the subsequent restart, Owen Farrell blemished his previously faultless first-half by kicking the ball into touch. A 30 metre Jack Goodhue break later, and Beauden Barrett was lining up a penalty in front of the post to reduce England’s half-time lead to five. After New Zealand changed the momentum leading up to half-time, Eddie Jones made a switch of his own in an attempt to swing the advantage back in England’s favour. Jones replaced Dylan Hartley’s solidity with the ball-carrying and glamour of Jamie George. It was a change that would later prove costly, with George missing numerous line-outs in the second-half at the hands of Brodie Retallick, and England were struggling to build pressure and territory. But Jones’ substitution was in vain, and New Zealand’s momentum continued until they took the lead for the first time – winning 16-15 with 20 minutes to go. Though England were perhaps fortunate to come away with victory last weekend after Owen Farrell’s questionable late tackle, this time they were on the wrong side of a subjective decision. With just five minutes to go, Courtney Lawes charged down TJ Perenara’s box-kick, and the ball fell into the grateful arms of Sam Underhill, who sprinted into the corner to send Twickenham into delirium. But Jerome Garces opted to send the call upstairs, and the TMO opted to reverse his call, suggesting that Lawes was offside. England sprinted back upfield for another chance, but when the game was screaming out for the forwards to carry the ball through the middle and set up a drop goal for Owen Farrell, replacement scrum-half Danny Care opted to send the ball wide and it ran into touch. It was an impressively spirited performance from an England side who have struggled in 2018, but look as if they have developed the backbone of a threatening team. Put simply, they just make too many errors at the top level to compete with New Zealand at the moment – England missed 39 tackles, and relinquished 25% of their set-piece ball. New Zealand are a lethal side, and the 20 minute period either side of half-time was ultimately the turning point in a game where points were at a premium. Next Post What did we learn from England’s tight victory over Japan?